In a video message, Bishop DeDe Duncan-Probe of the Episcopal Diocese of Central New York encourages us to continue our Lenten pilgrimage in the Easter season. Recordings of Bishop DeDe Duncan-Probe's weekly online bible study for Advent 2018. Bishop DeDe Duncan-Probe of the Episcopal Diocese of Central New York offers a word of encouragement in the midst of Lent 2019, and introduces the new diocesan vision statement. “See again that God loves us, God nurtures us, and God forgives us.” A message for Ash Wednesday and Lent from Bishop Duncan-Probe. "See again that God loves us, God nurtures us, and God forgives us." 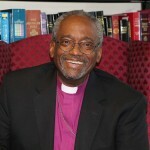 A message for Ash Wednesday and Lent from Bishop DeDe Duncan-Probe of the Episcopal Diocese of Central New York.